Combining cyberpunk culture, clothing, and LEDs might sound a bit radical, but people out there, right now, are creating clothing and accessories that will blow your mind. Thanks to the affordability of LEDs, the ease of 3D printing, and the accessibility of Arduino microcontroller programming, it’s now easier than ever to create absolutely stunning cyberpunk-inspired wearables. Here’s 8 of the best. 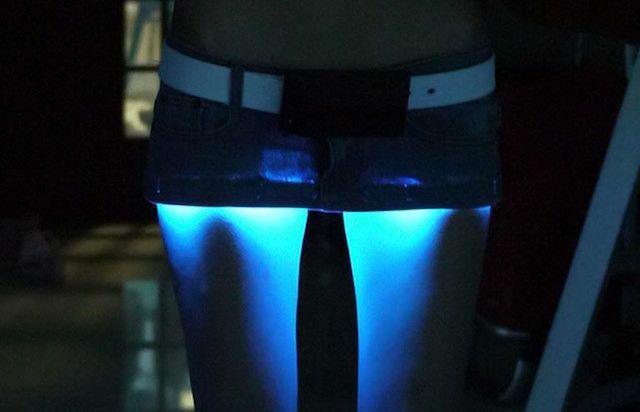 Our first look is a piece of clothing from Reddit user SexyCyborg, who combined LEDs and a miniskirt that is sure to draw attention. But don’t just think it’s a simple skirt with fancy lights, the practicality is sure to impress. The talented Chinese maker also fashioned a belt with a powerful battery, 3D printed a case, sowed a 5050 RGB LED strip inside the skirt, stuck the LED strip inside a plastic sleeve to protect against sweat and accidental liquor spills, and connected the whole thing via Bluetooth and to a phone app. If you’d like to build your own, you can learn about the process and follow along with her DIY instructions. The skirt is also able to change color based on her surroundings and mood, which she said made for a lot of fun during the Fourth of July celebrations. Practicality doesn’t have to be your main goal. If you’re going to a party that requires clothing of a rather unusual design, look no further than cyberpunk LED eyes. The designs can change from cyborg, demon, alien, and other creatures that go bump in the night. If you’re looking to make something similar, fret not. Head on over to the parts page on Adafruit.com, grab your finest soldering iron, watch the instructional video above, and carefully craft eyes that will surely entertain. You never know, you may get good enough and create a LED contact lens that displays readable information. If you’re looking for something that will sit on your head in a “high action situation,” you can reinforce the stainless steel wire or use other materials, which might prove handy if you’re jumping around at a dance party. If LED eyes are a little too skittish for you consider these LED cyberpunk goggles. In fact, there are a ton of LED goggles on eBay and Amazon, but you can also enjoy making your own or customizing a previous design. The best thing about the below video is that the goggles are made from “scrap electronics” you may have laying around the house, and are fairly easy to make. Now that you have your eyes or goggles sorted, you’re going to need to fashion yourself a wig. ‘Cause what good would a cyberpunk outfit be if you didn’t have glowing hair? This project from Adafruit.com will take some time, skill, and cost a bit more than the other projects. However, the results are stunning, as can be seen in the gif above. Once you’re comfortable working with Neopixels, you’ll have no end of other projects to try: an impressive looking cloud lamp, a LED pixel display, which can be good for a number of things, and an ambilight, which could make watching movies more enjoyable. Adafruit has another project that all cyberpunk enthusiasts are sure to love – 3D shoulder spikes. These bad boys are made from Ninjaflex filament (used for 3D printing), NeoPixel LEDs, and Gemma – a tiny Arduino-compatible wearable platform. As seen in the video, you can also print other designs such as ice crystals, which might be more to your liking if you’re planning to wear this in winter, or wear the spikes as a bracelet, belt, or neck band. Also, consider what SexyCyborg did above and link the wearable via Bluetooth and to an iPhone light mod or Android app so that your spike or crystals can change colors. You may have seen people wearing light-up sneakers for awhile now. They seem to be popular with kids and young adults around the world. And you may have noticed that some of these sneakers can get pretty expensive. Good news. You don’t have to spend a small fortune to own a pair of these sneakers. Simply buy a cheaper pair of sneakers you like, follow the Adafruit instructions, and save on your own design. You can choose any color of LED lights, and even add more tech to your design. For example, Flora, Adafruit’s wearable Arduino device, now includes a micro-USB port which can help you do more with your project. An EL (Electro-Luminescence) wire costume is a pretty cool weekend project, and a great way to impress your friends at a party or a fun night out. Even better, creating an EL wire costume isn’t so difficult, especially if you’re good at soldering. If you’re not so good, the EZ-EL group who made the costume above also created a video to help you learn to solder. The great thing about EL Wire is that it gives you a lot of creative freedom: more lights, fewer batteries, different colors, etc. The choice is yours. The only thing you need now for a perfect Cyberpunk costume is a mask. Good news. Etsy has a few great masks to choose from, or inspire. One that I found interesting is the Bandana LED mask from Huboptic. His designs are even featured in the official Skrillex – Dirty Vibe video. While you may not be able to wear all of these ideas together, you can certainly mix and match these items and impress your cyberpunk buddies. Don’t be afraid to try new things as you follow along with the projects. You never know what you can create, even if it isn’t something clothes related. This style is in its infancy, and can really take off with original ideas. Go for it! Try designing something new, DIY, and learn about the tech that makes these designs unique. Create something interesting. Do you think cyberpunk wearables will become a fashion trend? Do you see LEDs, Gemma, and other wearable tech items being used in everyday clothing items? Tell us your thoughts in the comments below.